March 6, 2013 by Verle L. Bell, M.D. or by comparing with others whom they deem to be worse etc. etc. They are puzzled by the guilt’s capacity to hang on and weigh them down and keep them up at night. 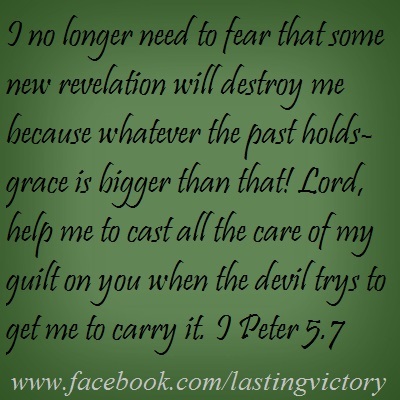 I no longer need to fear that some new revelation will destroy me because whatever the past holds-MERCY is bigger than that! Whatever today holds GRACE is bigger than that! Whatever tomorrow holds, the Lord’s peace will reign!